But that was long ago. Unklar himself now lies in the Void, and the dungeon, like so many of his creations, lies in ruins. The desolation of the temple leaves little to chance and its malignant inhabitants have their own desires and goals, often at odds with their one time master. 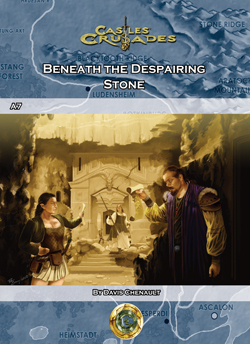 From the makers of the Castles & Crusades roleplaying game comes the seventh adventure in the Road to Aufstrag Series; designed for champions and heroes who must brave a demon's wrath to destroy an artifact of great power.